A reference for mosquito resources with a lot of tools: catalog, literature, map, vector ID, etc. Identification tool for 128 species of Culicidae (larval and adult stages) in Europe, the Mediterranean Basin, Black Sea and Middle East. A single common basis for genus and species identification. Much of the information is pictorial rather than text-based. Here are some links to image galleries (public domain or creative commons) that you can use for reference, teaching, presentation, and public health messages. A collection of still images, image sets, and multimedia files related to public health. E3 Geoportal promotes geospatial infectious disease modelling in Europe. Resources such as analytical tools, published risk maps and reports, software applications are available. The Literature Retrieval System (LRS) is an online collection of scientific papers comprising over 130,000 documents in searchable PDF format, drawn from books, journals, reprints, reports, and other sources. 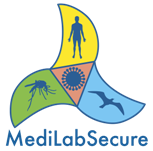 A number of well established networks have activities related to the MediLabSecure initiative. We invite you to visit their websites. A short presentation of selected Networks was given by our Work Package Leaders during our Heads of Labs meeting and can be downloaded in the private area. European Network for Arthropod Vector Surveillance for Human Public Health : Network of experts (medical entomologists and public health) for sharing data on the geographic distribution of arthropod vectors transmitting human and animal disease agentsImplementation of a sharing platform, click here to visit. European Network for Diagnostics of "Imported" Viral Diseases. Activities include epidemic intelligence, preparedness, support & training.The network is presently organised by M. Niedrig and his team from the Robert Koch-Institut in Berlin. Enhancing health security in the Mediterranean basin by supporting capacity building for prevention and control of natural or man-made health threats posed by communicable diseases through a sustainable training programme in intervention epidemiology. Contact : Concha Martin de Pando, MediPIET- Liaison Officer. Surveillance of invasive and native mosquito vectors and pathogens they transmit in Montenegro. Their partner networks can be found here.